Cravings for Klonopin typically begin as soon as someone stops using. The cravings are both physical and psychological. Psychological cravings may occur as a result of environmental triggers or stressors. People often use Klonopin to cope with social anxiety. For this reason, social situations may trigger cravings for the drug to make the person feel more comfortable. Physical cravings are typically only a problem during the withdrawal period and tend to lessen as time goes on. Physical cravings occur because the brain and the body have become accustomed to the drug. Over time, the brain and the body will adjust, and physical cravings and withdrawal symptoms will cease. People recovering from Klonopin addiction should expect cravings and accept them as part of maintaining long-term sobriety. Mindfulness: Mindfulness is a practice of acknowledging a craving for what it is, rather than trying to avoid it. It consists of cultivating awareness of one’s thoughts, feelings, and environment during a craving. When the craving arises, the person simply observes it and waits for it to pass. He or she focuses full attention on the craving and the thoughts and feelings it creates. Urge surfing: Urge surfing is a mindfulness practice. A person will typically sit down with eyes closed when a craving arises, observe the thoughts and sensations, and describe them out loud to oneself. For example, a person might think to himself, “I feel my heart beating fast” or “I’m feeling nervous and I’m craving Klonopin to help me relax.” The person would continue to “surf the urge” or observe the thoughts and feelings until the craving has passed. 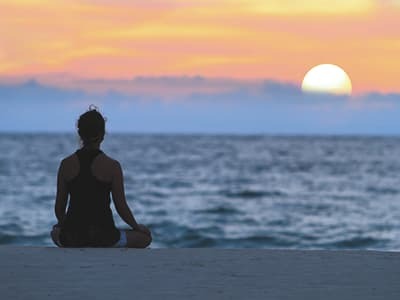 Relaxation techniques: Relaxation techniques, such as progressive muscle relaxation, guided imagery, and meditation can help recovering users deal with stress and anxiety, 7 and they can minimize cravings for Klonopin. 12-step meetings: Twelve-step programs are free support meetings that provide users with a structured process for recovering through the support of peers dealing with similar addictions. These meetings are an important part of the ongoing recovery process even after initial treatment is completed. Inpatient treatment: Inpatient treatment takes place in a residential setting on a 24/7 basis for a designated period of time, on average about 30 days in length. These programs offer a combination of individual and group counseling or therapy, physician visits, medical detox, 12-step meetings, support groups, and other alternative therapies. Outpatient treatment: Outpatient treatment offers the same types of therapies and treatment as inpatient facilities, but care takes place on a part-time basis, up to 20 hours per week. Individual therapy: Individual therapy helps users address psychological issues or emotional problems that may contribute to addiction as well as learn cognitive behavioral therapy techniques to deal with cravings when they arise. Group counseling: Group counseling is a powerful part of the recovery process. Recovering users are challenged and supported by their peers. No FDA-approved medications exist for Klonopin cravings. A physician may slowly taper you off of Klonopin or prescribe you a non-habit-forming medication to address anxiety, panic attacks, seizures, or insomnia. Tapering should only be done under the supervision of a physician. You will be given smaller and smaller doses over a period of time, which helps to minimize withdrawal symptoms and cravings. Anti-hypertensive medications, such as clonidine and propranolol, can also be used to help with cravings and withdrawal symptoms. Anti-seizure medications can be used to help manage withdrawal symptoms. Who Answers? to speak with a treatment support representative about programs for Klonopin cravings and addiction. Hobbies: Hobbies can keep you busy so you have less of an urge to use Klonopin. Some hobbies you might engage in include cooking, sewing, dancing, painting, playing an instrument, hiking, biking, or participating in a team sport. Meditation: A daily meditation practice for as little as 10-15 minutes each day can improve mental health and help you better manage stress, which reduces the risk of relapse. Associating with old friends: While you may miss your old friends, it is usually not a good idea to spend time with people who are still using drugs. If you begin to associate with your drug-using friends again, consider this a sign of a possible relapse. Isolating yourself: Maintaining an active social life is an important aspect of the recovery process. Those who start isolating themselves from family and friends put themselves at a higher risk of relapsing. Major life events: Any major life event (positive or negative) can trigger a relapse. Some events that may trigger relapse include weddings, graduations, divorce, job loss, starting a new job, breakups, death of a loved one, or the birth of a child. If you are going through a major life change, seek added support to help maintain your sobriety. Stopping attendance at recovery meetings: Attending support groups on a regular basis is important for maintaining sobriety in the long-term. If you stop attending your recovery meetings, you are significantly increasing your risk for relapsing. Following up with aftercare: Ongoing aftercare programs are crucial to maintaining long-term sobriety and health. Follow up with aftercare programs after you finish your initial treatment. Attend support groups regularly: Attending support groups on a regular basis provides continuous support, ways to deal with cravings and triggers, and reminders of why you chose to quit. Build a solid support system: Those with a support system are less likely to relapse than those who are isolated. Cultivate healthy relationships with those who do not use drugs. Get a sponsor: A sponsor is a sober person who has also recovered from addiction. You can call this person if you are experiencing a craving or are otherwise at risk for relapse. Twelve-step programs and other support groups often set people up with a sponsor. If you are struggling with Klonopin addiction and cravings, you do not have to struggle alone. For assistance finding a treatment center program near you, call one of our recovery support specialists at 1-888-319-2606 Who Answers? .
. Food and Drug Administration. (2013). Mediation Guide: Klonopin.
. Ehrlich, S. (2013). Relaxation Techniques. University of Maryland Medical Center.
. Williams, A. and Carey, M. (2003). Chapter 3 Sleep Hygiene: Several Methods to Improve Your Sleep. University of Michigan Health System.